Parkers Prairie, says former newspaper woman Sheryl Myers, is doing it again. donations to build a community center. And now, this growing city of 1,000 is coming together to replace the existing swimming pool, which the city realized was reaching the end of its life expectancy. "A lot of people became very concerned," Myers said. "As a community, one of the things we came to realize is it’s one of our biggest assets besides the school." About 200 children learn to swim there each summer. Myers credits swimming lessons with reducing the number of drownings in area lakes. The pool creates bonding time for grandparents, who bring their grandchildren to swim and play in the next-door park. The pool also draws visitors to the community, many of whom stop to eat, fill up their gas tanks and maybe do a little shopping. Myers leads the steering committee tasked with replacing the pool. 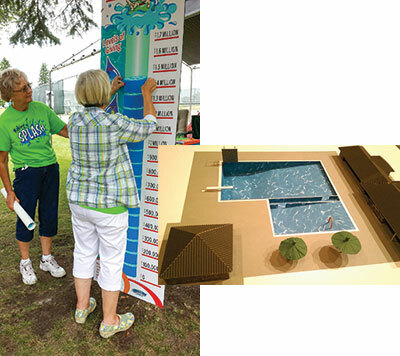 The city selected a $1.8 million design that elevates the pool to an aquatic center with a shallow pool that ramps down to a Junior Olympic-sized pool, and hopefully fun features like pop jets, a water dome, slides, a diving board and climbing wall, depending on how much is raised. After the design work, Myers needed help with fundraising. Several people recommended West Central Initiative, and she reached out to WCI Development Officer Kim Embretson. Embretson began a feasibility study, speaking privately to potential donors in order to learn what the community thought about replacing the pool. "I’m interested in attitudes and perceptions. Is the story persuasive? If it is, at what level are people willing to support?" he said. He learned that the community wanted more information about the project before supporting it. Because Myers’ daughters owned the local newspaper, it was fairly easy to start disseminating useful information. And when the steering committee launched its fundraising drive, it was able to answer donors’ key questions about cost and location. WCI provided marketing advice and also set up a component fund to accept tax-deductible donations on the city’s behalf. WCI sends out thank-you letters and reminders, and allows donors to contribute online at fund.wcif.org. Now the city is within $400,000 of its goal, aided by a $1 million challenge grant from the Lloyd and Beverly Paulson Family Foundation. The city just demolished the old pool and hopes to open the new pool in June 2016, Myers said. LEARN MORE about making a difference in your community through a component fund, charitable giving or estate planning. Visit giving.wcif.org, or contact Tom McSparron at 800 735-2239 or tom@wcif.org.